Here are a few of my favorite ways to be resourceful with a beautiful scarf. Let’s face it: Everyone’s favorite dinner party gift is a great bottle of wine. For your next hostess gift, follow these simple steps for a stunning presentation that lets you make an impact with two bottles of cheer. 1. Lay the scarf out on a flat surface with the most decorative side facing down. 2. Place your wine bottles diagonally on the scarf, bottom to bottom with about an inch between the two bottles. 3. Wrap the bottles in the scarf by folding the closest point of the scarf towards the opposite one until it is over the bottles; rolling the bottles in the fabric completely towards the other point. 4. Once rolled, the space you left between the bottoms means should allow you to stand the bottles up. Tie the excess fabric in a sweet knot on top to secure the bundle and create a handle. 5. 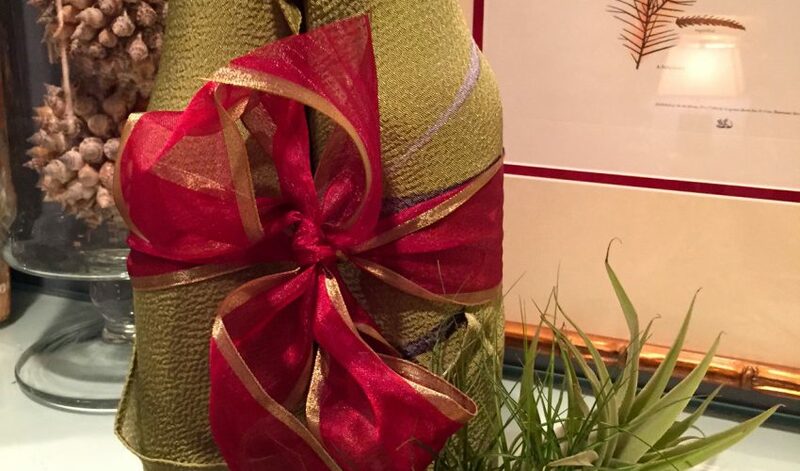 Finish with a festive bow that suits the occasion. (Red for Christmas as shown here, blue for Hanukkah, floral for Easter, pink for Mother’s Day, etc.) Voila! You’re sure to be your friends’ favorite party guest. A striking bouquet of seasonal blooms is always a thoughtful gift. Be memorable by wrapping flowers in a scarf that compliments the bouquet’s colors. 1. Lay the bouquet diagonally so that the blossoms are approximately lined up with one point of the scarf. 2. Take the corners on either side of the bouquet and wrap them around the stems so that they criss-cross over and under the bouquet. 3. Once the scarf is wrapped around once, tie the ends in a pretty knot in the front of the bouquet. Replacing traditional wrapping paper with a silk scarf is both a creative and eco-friendly alternative. Plus, this pretty technique eliminates the need for ribbons and bows. 1. Lay the scarf out on a flat surface with the decorative side down. 2. Place the gift in the center of the scarf. 3. Grab two opposite corners and tie above the gift. 4. Do the same with the remaining corners. 5. Tuck any remaining scarf fabric into folds. Secure with a safety pin if needed.